Gamber-Johnson is a leading developer and supplier of durable, high quality mounting systems, docking stations and related products for mobile communications, computers and other electronic equipment. Gamber-Johnson offers an extensive product line of modular assemblies for all types of vehicles that serve the law enforcement, mobile office, utility, rail, aerospace, public safety, agriculture, marine, fire, police, trucking, and heavy equipment industries. 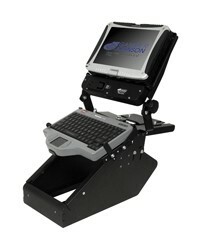 A Gamber Johnson Pedestal System is used when mounting a laptop in your vehicle. This mounting system can be used in a vehicle with Bucket or Bench seats, and is typically mounted on the passenger-side floor. Gamber Johnson Vehicle Bases secure the entire mounting system to the vehicle. Bases are constructed of heavy-gauge steel and designed for long-term use. Some vehicle bases are "custom bases," which are designed to fit a certain vehicle and attach using the existing seat bolts, while other bases require drilling. A lower tube is typically attached to the vehicle base; if one is not already welded to the vehicle base, you will need to order one separately. Gamber Johnson Lower Tubes and Upper Poles attach to the Vehicle Base and together provide the means for adjusting the overall height of the mounting system. They also help to bring the computer closer to the user, and there are accessories available that limit vibration or provide a quick-release option. Gamber Johnson Motion Attachments join the Upper Pole and Cradle/Docking Station (the item that actually holds your laptop). These help to create a more comfortable experience by providing tilt, swivel, slide, and extension to adjust the working angle of your laptop. Bring the laptop closer to you while you work, then store it out of the way when you're done. Gamber Johnson Cradles and Docking Stations attach to the Motion Attachment and safely secure your laptop computer in your vehicles. Gamber Johnson Docking stations typically provide port replication - a simplified way of "plugging-in" a portable laptop computer to common computer peripherals. A cradle does not provide any port replication. Gamber-Johnson designs specific rugged mobile computer solutions and docking stations for Panasonic, Motorola, GD- Itronix, DRS, Getac, and Dell. Gamber Johnson Radio Center Console Systems are generally used in the Public Safety industry and mounts multiple radios and equipment low and out of the airbag zone. Together our Top Plate, Vehicle Legs, and Console Box make up the MCS mounting system. You can easily integrate a Gamber Johnson Computer Cradle/Docking Station by attaching a Lower Tube and Upper Pole to the Top Plate. Gamber Johnson Mobile Workstation Systems are generally used in the Utility industry. This system typically mounts on a flat floor between the driver and passenger seats, providing convenient storage and a platform for mounting a computer cradle or docking station. that serve the law enforcement, mobile office, utility, rail, aerospace, public safety, agriculture, marine, fire, police, trucking, and heavy equipment industries. Contact us today for a free consultation! All Gamber-Johnson Mounts for Vehicle Electronics Vehicle Bases for Electronics Vehicle Cradle & Docking Stations Vehicle Mission Control Systems (MCS) Vehicle Mobile Workstations Vehicle Motion Attachments Vehicle Mounting Poles Vehicle Printer Mounts Vehicle Radio Racks All Products Index in Alphabetical Order Pedestals A Gamber Johnson Pedestal System is used when mounting a laptop in your vehicle. This mounting system can be used in a vehicle with Bucket or Bench seats, and is typically mounted on the passenger-side floor. Vehicle Bases Gamber Johnson Vehicle Bases secure the entire mounting system to the vehicle. Bases are constructed of heavy-gauge steel and designed for long-term use. Some vehicle bases are "custom bases," which are designed to fit a certain vehicle and attach using the existing seat bolts, while other bases require drilling. A lower tube is typically attached to the vehicle base; if one is not already welded to the vehicle base, you will need to order one separately. Poles Gamber Johnson Lower Tubes and Upper Poles attach to the Vehicle Base and together provide the means for adjusting the overall height of the mounting system. They also help to bring the computer closer to the user, and there are accessories available that limit vibration or provide a quick-release option. Motion Attachments Gamber Johnson Motion Attachments join the Upper Pole and Cradle/Docking Station (the item that actually holds your laptop). These help to create a more comfortable experience by providing tilt, swivel, slide, and extension to adjust the working angle of your laptop. Bring the laptop closer to you while you work, then store it out of the way when you're done. Cradle and Docking Stations Gamber Johnson Cradles and Docking Stations attach to the Motion Attachment and safely secure your laptop computer in your vehicles. Gamber Johnson Docking stations typically provide port replication - a simplified way of "plugging-in" a portable laptop computer to common computer peripherals. A cradle does not provide any port replication. Gamber-Johnson designs specific rugged mobile computer solutions and docking stations for Panasonic, Motorola, GD- Itronix, DRS, Getac, and Dell. Radio Center Console System Gamber Johnson Radio Center Console Systems are generally used in the Public Safety industry and mounts multiple radios and equipment low and out of the airbag zone. Mission Control System (MCS Series) Together our Top Plate, Vehicle Legs, and Console Box make up the MCS mounting system. You can easily integrate a Gamber Johnson Computer Cradle/Docking Station by attaching a Lower Tube and Upper Pole to the Top Plate. Mobile Workstation System Gamber Johnson Mobile Workstation Systems are generally used in the Utility industry. This system typically mounts on a flat floor between the driver and passenger seats, providing convenient storage and a platform for mounting a computer cradle or docking station.